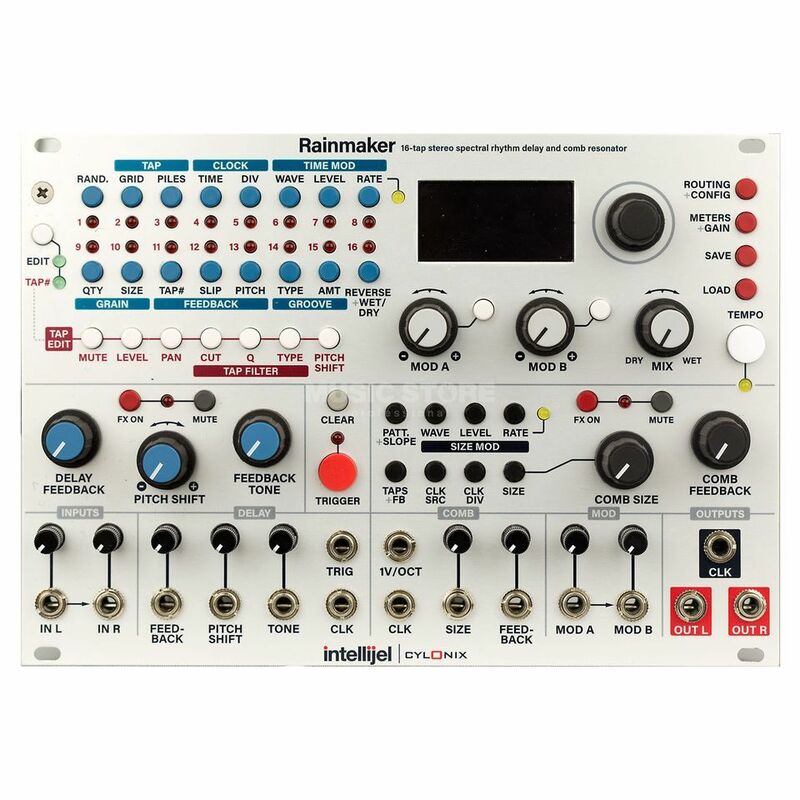 The Intellijel Cyclonix Rainmaker is a 16-Tap stereo spectral rhythm delay and comb resonator. The stereo rhythm delay has 16 taps, each with its own resonant filter and granular pitch shifter. The filters have independently adjustable resonance and cut-off frequency, and can be set to either low-pass, bandpass, high-pass or bypass operation. The filters are also capable of self-oscillation, enabling modal synthesis techniques. The granular pitch shifters have a range of 15 semitones up or 16 semitones down. Each tap can repeat at a rate value set in tap#’s in order to create regenerating echo effects. The feedback signal has a low-pass/high-pass tone control and its own pitch shifter. The tap delay times can range from 0.1 millisecond up to a maximum of 20 seconds. The overall delay times can be set with the rotary encoder, the tap tempo button, or synced to an external clock. The stereo comb resonator section has 64 time-delayed taps which are summed. This produces a deep comb filter or resonating effect. At large comb sizes a multiple echo effect is produced. The density of the resonator can be varied. The tap with the longest delay time is fed back to the input. High feedback levels, with short comb sizes, produce “Karplus-Strong” types of plucked string sounds. The relative timing of the 64 taps is set according to one of 16 different pre-set patterns, which provide different resonator timbres or echo rhythms. The comb size can be set either with the rotary encoder, an external clock or through an input voltage. The Rainmaker module has extensive voltage control capabilities. Direct voltage control is available for the delay feedback level and tone, the global pitch shift for all delay taps, the comb resonator size, and comb feedback level. There are two assignable modulation inputs, which can be assigned to different parameters in each pre-set. A trigger input with assignable functionality can trigger built-in types of noise bursts, freeze the delay buffer, reverse the delay, randomize parameters, mute taps and more.